The road Avingard traveled along turned southwest, eventually crossing over into the Falkreath Hold, which was the same hold Avingard had initially visited when he arrive in Skyrim. Eventually Avingard came to a crossroads. Going south would eventually lead him back to Falkreath, to the west lay Markarth, north would take him to his destination – Solitude – and returning east would take him to Whiterun. After a brief moment Avingard turned and headed north towards Solitude. The city of Solitude, in the Haafingar Hold, was located at the northern part of the province of Skyrim, and at the moment Avingard was in the southern Falkreath Hold. It was going to be a long trek to reach his destination. Luckily the weather was holding as the sky was clear and the sun was shining. After a few minutes traveling on the road heading north Avingard could see four figures walking along the side of the road just ahead of him. Avingard was walking faster than the four figures so he slowly caught up to them. As he got closer he could make out that three of the figures were Imperial Legion soldiers, and the fourth appeared to be a Nord with his hands bound in front of him. Two of the Imperial soldiers followed behind the Nord and the third was out front leading the group along the road. As Avingard began to pass the legion soldiers he glanced over at the bound Nord. The Nord didn’t acknowledge Avingard but just continued to look forward at the lead soldier. Not wanting to start any trouble, especially with the Imperial Legion, Avingard moved over to the other side of the road and picked up his pace. 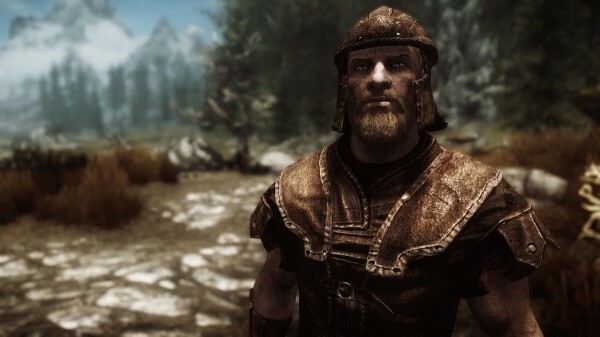 After his quick look at the Nord he realized that the Nord was a Stormcloak and was probably being escorted to a prison or his execution. The Civil War has torn the province in two – the Empire and the Stormcloaks – and being imprisoned or executed happens frequently throughout the province. Avingard continued his travels along the road, going north to Solitude. There really wasn’t much to see along the road as it passed through the tundra of the Whiterun hold, with few trees. To the west, however, Avingard can see large cliffs within the Reach, which is a hold on the western border of Skyrim. Off in the distance Avingard began to notice several buildings. As he approached he noticed that he had come upon a small farming town consisting of four buildings with a single road running through the town. Checking his map, Avingard noticed the town was called Rorikstead. Off to the left side of the road Avingard also noticed three robed figures walking ahead of him. He soon recognizes them as Thalmor, the government of the Aldmeri Dominion, and the foes his father had joined the Redguards in fighting during the Great War. The Thalmor walked along the road with little regard to the inhabitants of the small town of Rorikstead, and it seemed the Thalmor thought themselves above all citizens of Rorikstead, maybe even all of Skyrim. 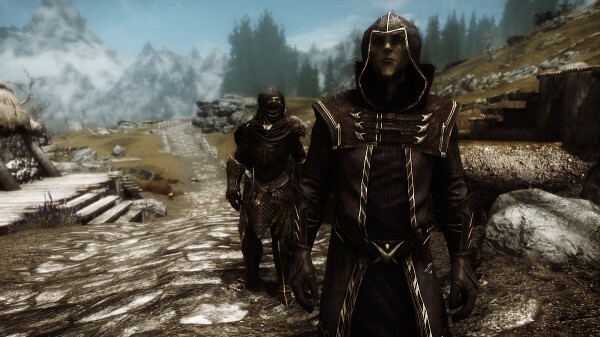 Since his arrival in Skyrim, Avingard has heard rumors of Thalmor traveling along the roads to enforce the ban on the worship of Talos. As he approached the Thalmor, the one at the back stopped and looked at Avingard. “Stand back. This is official Thalmor business,” the Thalmor member warned Avingard. While Avingard felt resentment towards the Thalmor, and even more now that he has seen them, he also realized his skills were no match for the three walking along the road. He stopped walking and let the Thalmor gain some distance between him and them. Once the Thalmor had passed through the town, without any of the townsfolk really paying attention, Avingard continued along the road, being careful not to get close to the Thalmor as he walked. As Avingard climbed a small hill and then descended the other side he noticed that a wolf in the brush began to stalk to Thalmor. A few seconds later the wolf lunged forward at the lead Thalmor member. The Thalmor quickly took an aggressive stance to meet the challenge of the wolf, while the remaining two removed weapons in support. None was needed, however, as a quick, and powerful bolt of lightning shot from the hands of the lead Thalmor, killing the wolf instantly. The whole attack lasted seconds. With the wolf dead, the Thalmor put away their weapons and continue on their way. Avingard stood in amazement at the power of the Thalmor, and then continued along the road, as well.